These two pages are from Ben and Le-Anne's wedding album and show the very end of the wedding ceremony itself. Ben and Le-Anne had asked for two wedding photographers, and the two photos shown here were taken by my associate who was standing at the back of the church and shooting with a long telephoto lens. It's always interesting having two photographers, especially during church services. If you have one photographer at the front of the church, and one at the back, you have so many different avenues to explore when it comes to photography. One of the best reasons to have two wedding photographers for a church service is that you can have one photographer at the back, watching the groom's reaction as he sees his bride in her wedding dress for the first time, whilst at the same time the other photographer at the front of the church is able to look back the aisle, past the groom and photograph the bride's reaction to walking into the room. Another situation where it's a good idea to have two photographers is during the first Kidd of the bride and groom. 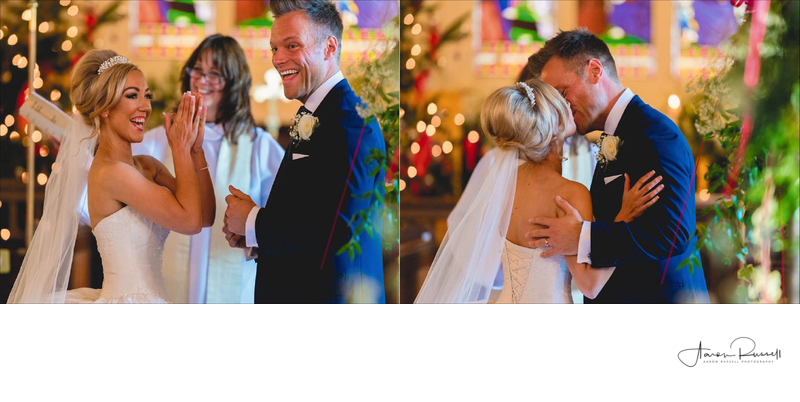 In this instance, having my associate photographer at the back of the church provided these two wonderful images, whilst I was capturing the same scene, from another angle from the front of the church. As you can see, the vicar raised her arms as the bride and groom kissed, blocking my view! Luckily the second photographer was ideally placed and ready to shoot so we still have evidence of this amazing event.